Charles Hanson and Catherine Southon hunt for antiques around Sussex. Will 18th-century buckles get the bidders in a tizz or will English silver be the order of the day? 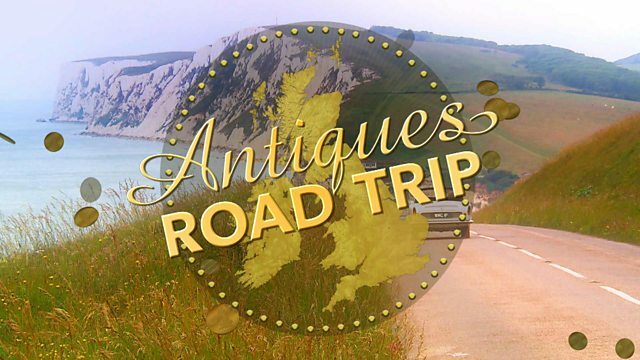 ..a classic car and a goal - to scour Britain for antiques. Why do I always do this to myself? Come on - stick 'em up. ..or the slow road to disaster? Catherine Southon and Charles Hanson. How exciting. They make a nice couple, don't they? and I've come very far south to take on a southern lass. That's it. Southon in southern. and I'm feeling it, but not that much. who knows his stuff when it comes to sniffing out antiques. Oh, look at this little lamby! is the queen of brokering a good deal. How do you play the Road Trip game? -I don't have a game. I don't have a strategy. -My seat has gone back. Sorry. Sorry, Catherine about that. our experts will be zipping around in this snazzy 1981 MGB GT. and then travelling through the Peak District. They will finish up with a final auction in Congleton in Cheshire. and end in Paddock Wood, Kent, for an auction. Nice. Charles, it is getting really hot in here. You think this is right? Um, do you mean the car or us? Yeah. This morning, our Charles will shop first. -I'm very well, thank you, Charles. show Charles, and she's a good egg. Hello. Is that ostrich egg? Of course. It's a cigarette stand, isn't it? What is it - 1930s? It's so, I suppose, stylish. So really because this obviously is a faux shell. It's not a real shell, is it? It's just made to imitate some type of ostrich egg. It's a really stylish object, Amy. OK. You're happy. No problem. 20. And he rather fancies this Minton bowl. Goodness knows why. we call this blue Blue Celeste. against this really well-illuminated skyline. the £120 ticket price, then? I'd want to pay you about £50. -I think that's too low, I'm afraid. Would you meet me at £60? Let's do it at £60. Amy, you are happy at 60? -I think we're all good at 60. You slightly lost me there, Charles. what else is here of interest? A little rootwood carving of an elder. And this would date to around 1880. He has got a split. but the detail in there is very, very nice indeed. Nice patination. David, how much is he? And the best on him would be? It's a £10 sale. Well done. Cor, he is on a roll, isn't he? That's another lot bought and he is showing no sign of stopping. What is this ink stand here, David? -Well, I believe it to be Black Forest. -OK. So it is German. I think it is about 1900, 1910. -But it is in remarkably good condition. associated with travel, and very popular today. What would be your very best price, Amy? I like it, but my bid would be £70. £75, and you've got a deal. -I'll take it. Go on, thank you very much. aren't particularly popular these days. And your best on that is 20? it's got great style, I will buy this for £20. It seems like a no-brainer to me, and he is done! That's a huge £165 spent on four lots in his very first shop. for her first shop of the day. And she's made a beeline for something elegant. I have actually done OK with some fans recently. so that means there is obviously something wrong with it. Well, let's get the lowdown from dealer, Ian. It's in a little bit of a poorly state. -Oh, gosh, it is, isn't it? OK. Right. You don't have any more, by any chance, do you? Well, actually, I have. I've got two more which I haven't priced up yet. I haven't put out for sale. Lovely! This is getting exciting. Right, let's see those fans. I used to have a few of those. three fans in very poor condition. These two you haven't put prices on. -I mean, he's put £12 on that, your friend, Simon? I mean, I would probably offer eight, if that is acceptable to him. -Eight for this one, alone? I think I can do it for ten. Oh, OK. And then I would probably say ten for each of those. Shall we see what else you might buy? Well, I'm quite interested in your little puppy outside. -How much is that doggie in the window? Well, actually on the path. as the larger full-sized Great Dane. Is he not very old? He's probably about ten years old. What sort of price could he be? -He could be about 30-ish? If we can say 30 on the fans and 38 on him, we've got a deal. You don't think we could do 32 on the fans and 38 on him? Oh, I'm not going to argue over £2. -I'm not going to argue over £2. It's been lovely. £32. £38. What are we going to call him? Well, let's hope he lives up to his name. So that is the trio of fans and Lucky the dog bought for £70. to the small town of Petworth - I live near there. Charles is heading into Petworth Antiques. With just £35 left in his pocket, he'll need to be canny. it can be quite mundane and quite boring. and this coffee cup would date to around 1785.
which might suggest it is experimental. It could be quite an early coffee cup. With a ticket price of £10, it is time to talk to dealer Jeff. 1,000 pence and the best price would be, in pence? 800 pence. That's not bad. 800 pence. -A good buy, I think. -It just sounds a bit more grand saying pence. If you say so, Charles. And it looks like that is a deal done on the Caughley coffee cup. And with that, a day's shopping draws to a close. And just like that, Catherine and Charles are back on the road. home to our experts' first shop of the day. This is well-known territory to me - I will show you around. has just under 30. Crumbs! Oh, look, smiley owners Michelle and Craig. This cabinet, I feel, is a very good place to start. -Hello, I am back with the keys. -Can I call you Michelle My Belle? It might give us a discount as well. Thank you, Michelle. ALARM SOUNDS Oh, my Lord! Charles! Meanwhile, Catherine has spied a small charm that she likes. You've got this nice sort of embossed design. I would have thought it is about 1920. -Can I hold on to that? -Would you mind? Can I give that to you? A little bit different. And we all love a fan, don't we? Well, you certainly seem to this Road Trip. What else has caught your eye, then, old girl? I'm not a big fan of brooches, but she is quite sweet. the middle, but something like that.. I mean, and she's quite elegant. Her pose is quite elegant, isn't it? It has got 50 on it. because Charles has found a Swansea porcelain ink stand. He only has £27 left, so fingers crossed, eh? of Georgian porcelain and then it would date to around 1820. How much could that be, Michelle? I will have to phone him because there is no ticket on it. -Could you give him a call? All right, I'll ask him, yeah. Hi, Ian, it is Michelle. Hello, lovey, how are you? Right, Michelle My Belle, what news? Really? I just wonder if you could do £28? -I will buy that for £28. Oh, no, you won't. You're short, Charles. I've only got £27 left. -That is not on purpose. I am a pound short. And you really have completely cleared me out. Yes. It's fine, it's fine, never mind. Are you sure? Michelle My Belle, give us a kiss. How about some Asprey hair brushes? -so they haven't even been cleaned yet. So this would've been in a set once upon a time. Perhaps with some other little jars or something like that. And maybe a hand mirror, probably. which I think is fantastic. Did you have a price in mind for these? Yes. They come in at a massive £10 each. Can they be 30 - is that cheeky? Did you find out anything else on that? and we're going to take 30 on it. You can do 30? That's wonderful. I will take that at 30. This had a little ticket on it. What price...was it 12? It was £12, so it's £10. Can you do that for eight? So, if I can do eight for that, that's lovely. And £35 for the Asprey hairbrushes makes a combined total of £73. and has made his way to Brighton. But he is not here to stroll along the prom, prom, prom - oh, no. who knows a thing or two about Brighton's sewers. -Hello, Charles, nice to meet you. That smell. It is great taking in this lovely air. but back then there was a stench, wasn't there? There was a very bad stench, yes. Because Brighton didn't have any sewerage system at all. they used to tip them in the streets. and then go out into the sea. what the sewers did to make this what it is today. -Great! I can't wait, Stuart. for their annual seaside holiday. As a result, parts of Brighton struggled to cope. by creating a sewerage system. -That is raw sewage going through there at the moment. Oh, my goodness me. So are we now...? This is the old Victorian sewer. Everything you see today with me is the old Victorian sewer, yes. There is a surface run-off. -No, that is just condensation in here at the moment. -This is where the rats normally sit. -There's none here, so you're all right. in the nicest sense of learning about history, it's awful. Gosh, we're quite deep now, aren't we, underground? to what I can see is what a tremendous feat of engineering. the brickwork around a wooden frame. and Cannon Street railway stations in London. What did Sir John Hawkshaw do? All I can see is a tunnel. What was different with his work? at all, and everything was done by gravity. as you can see. I'll show you with my torch. As you can see, the egg-shaped barrel there. the end of this pipe bit. What a man Sir John was. He almost, I suppose, rescued Brighton from what had been. I think he helped make it as popular as it was. And it is still in very good working condition now. Which way are we going now, Stuart? As you go round the second bend, just mind the step down. I feel like I'm in a loo, literally. I wish he would stop jumping up and down. Stuart, I can see light. Wow, that is amazing, isn't it? we have been told there is over seven million bricks in here. They employed Irish navvies, actually. So the Irish came over in their droves to support this build? And it cost quite a bit of money in those days. They estimated the cost to build this at £80,000. -That would work out to be about £9 million today. You would never get brickwork laid like this now in this day and age. It took from 1869 to 1874. It was five years, which is incredible. fragrant and safe from disease. The sweet smell of Brighton is here once again. to Peacehaven for a final spot of shopping. Good afternoon. A pleasure to meet you. Hello, Steve. Catherine has £57 still to spend. Thank goodness there's lots of stock. Whenever I see anything shagreen, I have to pick it up. Shagreen is the most wonderful material. So this is dyed, dyed green shark skin or ray skin. You find a lot of things made from this in the Art Deco period. This is probably '20s, '30s. that would have been absolutely gorgeous. Can you do this for 20? 22 really would be the lowest. I'm going to buy this at £22. That purchase brings the shopping to a close for this Road Trip. and the 1950s silver ballerina brooch. She spent a total of £165. if it's right, is worth a fortune. So, what do they make of each other's lots? made in Cotswold stone, was an inspired buy. it's worth between 50 and 70.
but have you spotted that massive crack down it? But then he only paid £8 so who knows what will happen? auction in Paddock Wood, Kent. And they are raring to go. We are literally at the back of the saleroom. -Everything is in our favour today. Hop Farm Auction Rooms is the place of battle. I think my favourite for the auction has got to be the Black Forest. I think that one has just got it all going on. that I can't buy it myself, I have to say. surprise hit of the auction, I think. it's time for this pair to take their seats. First up, Charles's Minton bowl - this could be good. 100, it starts at 100. -I do hate to disappoint. -It's a great object, I had £100. 110, 120, 130, 140, 150 now. 160 on there, 170 now. -I'm over the moon with that. Yeah! I just liked it. -I wonder if they know about the chip. Charles is off to a flying start, though. That was your best thing. Yeah, it was, and my blockbuster paid off, and I'm delighted. Can Catherine make as big a splash with her first lot? Her set of enamel brushes are next. -Put it there? That's good, well done. At £60, £60, 65, 70, we're there. -£70 here, 75 we want. Yay! He's a friend of mine. Hey! That's a profit apiece - great stuff. Charles is up again, this time with his Swansea porcelain ink stand. -Thank you, net, I'm happy. 32. 32 is at the back, 32. 34's there, 36? 36 there. -42 is there - 44, anywhere? -It doesn't need any more! 46 there, 48, 50 now. At £50, we're selling at 50.
but it could have been more. Shall I go? You want to do this Road Trip by yourself? Thank you, Wales, and thank you, Kent. Time to find out if there are any dog lovers in the room. Will he prove to be lucky? -£22, 22 is online, 24. -The sympathy bids are coming in. -Yay! 32, 34. 34 is online. 36. 38's there, 40 now. 44, back in. 46 there, 48 to you. It got there in the end. And it's another profit for Catherine. -Now, Charles, this time with his Oriental old boy. 32's online. 32 it is. At £32. Sells at 32. Charles is certainly on a roll today. Catherine's fan selection is up next. 22 now, straight in at 20. Net's in. Watch the net go. Watch the net. Still cheap for this lot. -22 is there, 24, 26, 28, 26 there. 28, 30. 32, 34. No? 32 it is. In the middle at £32. Anywhere else? Still pretty things, still cheap. -There's nothing on the net. £32 it is , it sells at 32.
and one which didn't pay off, unfortunately. I'm really gutted. I really, really thought they would do brilliantly. will go up in smoke or not. -£60 I'm bid. £65 we want. -Look! We're live in the States. £60 I've got, £65 we need. At £60. It's still cheap, isn't it? and the world saluted my egg and it hatched. I'm delighted. Oh, if looks could kill. with her pretty little silver ballerina brooch? Start straight in at £36. £38 there, 40 is here, 42, 44, 46. -46 there, 48 we need. You've got to be pleased with that, Catherine. -That's good. That's sweet 16 profit. Next up, Charles's rare Caughley coffee cup. -Yes, straight in at 30. -32 we need. Still cheap. £30 there, 32 we want. £32, at £32, it is 34 we want. -Still going on the net. -At £32, £32 it is, at 32. -Another cracking profit there for Charles. Look at me. Thanks a lot. That's good. the Art Deco gents' lighter. 24, worth a lot more. -Too little ducks. Quack quack. -22, and 24 we need. Well, at least it wasn't a loss. you're thick-skinned as well, come on, it doesn't matter. Here comes Charles's final lot, the Black Forest desk stand. -100 I'll take, 100, thank you. -You should take that and run. £100 it is. 110 now, should be more. -Hold tight, baby. I'm sorry. -Are you paying these guys? -Hello, Internet. America is calling. It's the American dream. Come on, America. Come on, America. -220, 230. 230 is there, 240 now. 230 it is. Baby, hold tight, it's a funny old game. 230 in the room, 240 we want. -240 is there, 250 is yours. -250 it is, 260 now. -At 250 in the room. -At 250 it is, selling. I think I need a kiss for that. I think you should do a little dance. I might have a little jig for joy. I might do a little jig for joy as well. -Sorry. We're being told off now. of £13.76 after auction costs, leaving her with £213.76. with giggly twosome Charles amd Catherine. They do love a laugh. and aim for auction in Bourne End in Buckinghamshire. They're sharing their first shop. Fortunately, it's a biggie. Dealers Jamie and Trevor are on hand to help. -I'm Trevor. How nice to meet you. Time to split up and browse. Antiques don't buy themselves, you know. Catherine has just over £210. I quite like this. What's this over here? -Oh, the clock and the manicure set. for keeping your nails neat and tidy. How sweet. A set of manicure tools. To make something on this, I need it to be more like 15. Could we split the difference and come in at 20? -OK, let's put that as a possibility. because I feel you have a lot more to offer here. One item put aside. And what's this? ..railway sign. It's very heavy, be careful. -It is heavy, isn't it? Cast iron. "is liable to a penalty." That's a big lump, isn't it? What's ypur best, then, Trev? -I'm happy to let you have that for 15, if it helps. Another item to set aside. And there really is no stopping Catherine this morning. Go, girl. -Yeah, that's unusual, isn't it? embellished with a carved figure? -The sticks are all good. Isn't this terribly bad luck to put that over your head? Oh, yeah, thanks. God, I don't need any more bad luck! I don't need any more. Charles, do you want an umbrella? Now, Charles has a huge £480. And this looks promising. They're good signs, aren't they? Ticket price on the lot is a whopping £600. can be struck, while Charles browses on. But elsewhere, Catherine has also nabbed Jamie's attention. Tell me about the bubblegum machine. It's very good. It takes 20p pieces. -You can use it as a money box, if you want to. -Oh, you can use it? Yeah, you can use it. Oh, yes. It dates from the 1980s. Ticket price is £75. Can we say 25 and I won't go down any more? -I'm going to shake your hand on that. Crikey! Catherine bags the sweetest of discounts. But, despite the dancing, she's still got a heap of items set aside. which Trevor has had some word on. He's prepared to let you have that for £18. I can do the clock for 15 for you, if that helps. Right. So we've got 15 on the clock. -We can do that for 15? -I'll do it for 15. Yeah, I think that seems pretty good. and Catherine also has the bubblegum machine she bought earlier as well. and she's finished here also. dates from around about 1900, and it's priced at £95. -No, you read my mind. What did I say? -I think you might say about £30. -I had £30 in mind. -And that still gives you a profit? Lovely. That little "face-off" - ha-ha! means Charles finally has his first item. And now, the owner of all those signs is on the blower. What might he do if Charles takes all six? So, if we both say together, the best price was...? but Charles still wants to keep his options open. would you have an agreement to hold them? -And I will, either way, call you. Jamie, you are a gent. Charles has those on hold, and the mask in the bag. where she is strolling into her next shop. Quite nice. So we've got a leather Georgian fire bucket. That's quite nice, isn't it? It's in quite nice condition. People like these. What can Pam and Terry do for you? -it's at least 200 years old. aren't so worn. Because this is quite worn. But will this deal hold water? Would that be your best on that? I can do you £100. -And 90 is your best price? leaving her with just over £50 left to spend. The morning sun finds them back in the MG, and raring to go. You know, the sun has got his hat on today. It's going to be a hip, hip, hip hooray. And I can't wait. Yeah. And neither can I, Charles. They have arived in the village of Headcorn. Catherine's dropping Charles off at his first shop. Drive carefully. See you later. Good luck. Chsrles is meeting Shirley, owner of Allsorts. -Shirley, good to see you. -It's nice to be here. -I like your antique shop. I'll go for a wander. -Just Shirley here in Kent. I like your style. We're friends in Kent. That's great. Now, that's a lot of crockery. Isn't that pretty? Isn't that a beautiful shape? It's so... So Art Deco. a Staffordshire pottery maker founded in 1907. But this set dates from the early 20th century. and this sort of set just makes you feel happy. the sun is shining in Kent, and importantly, I like this. Ticket price is £45. Oh. Shirley...! Shirley! You're a lady who's full of joy. What could be the best price on that? I'll have to phone the dealer for you. -But I'm sure we can do something. He's got 45... I don't know if he'd go as low as 30. Within a flash, Shirl the Pearl has the answer. -I've spoken to the dealer. -Full of Art Deco promise. Hit me. -Yes, you can have it for 30. -I'll take it. Thank you. I'll take it. That's one down. Fantastic. I'm delighted, Shirley. And that's another tidy little buy for Charles. so she's galloped straight back to the town of Maidstone. Cantered, actually. Where she seems to be horsing around. Ha! Where did you get that wonderful conveyance, ma'am? to my carriage. This is even more classic. Eat your heart out, Charles Hanson. -for the Tyrwhitt-Drake Museum of Carriages. -Thank you, Wilbur and Buster. Here she's meeting Maidstone Museum's director Victoria Barlow. -Victoria, very nice to meet you. This place holds a collection of over 60 carriages. when horsepower was really the thing. We owe its existence today to its founder and namesake. Who's our friend here, then? but he came from a local brewing family, so very wealthy. he began to see that carriages had had their day. so that we would know what it was like. to the 19th century, when it opened up to ordinary people. Well, this is quite an important carriage in the development of them. because of the noise its wheels made on the floor. and take their family out in it. This made carriage travel an option for the middle-class masses. -and these became the first hackney carriages. evolved along some more daring lines. looks structurally very different from what we've seen downstairs. driving you while you sit in comfort at the back. This is actually an owner-driver vehicle, so you drive yourself. It meant that it became very popular with young men who liked speed. So this was, you know, the sort of sports car of its day. Catherine another carriage that really typified the age. This is lovely and open, this one, isn't it? It is. This is a Victoria. who very much popularised carriages as a way of being seen by a crowd. so you could ride in privacy. This carriage is all designed to show off. you want people to see it. So you could fold the roof back down and the sides are cut away very low. so her subjects could see her. but these still have an elegance and romance all of their own. Well, I have to say it's been wonderful. Now my carriage awaits. And I have to head off. -Thank you so much, Victoria, thank you. You could get too used to this, Catherine. Walk on, as they say. ..where he's sauntering off into his next shop. Andy's in charge here today. True to form, Charles doesn't take long to spot a possible. It's this revolving cabinet here. and I think he's right. So, you'd put them on like that, wouldn't you, in the day? So... Maybe a Georgian gent, and don't my shoes look better now? -They do, they look beautiful. Ticket price on these handsome accoutrements is £150. But what might be Andy's bottom line? To be honest, I'd like about 80. -Could you go a bit less, do you think? You're an odd and I'm an even. And I wonder if you could be an even-steven and meet me at £60. -It still gives me a profit, yeah, absolutely. -Done. Sold. Thanks a lot. That's one more item bagged, but Charles is still on the hunt. Watch out, he is in a cabinet. Quite like this vase down here. And that landscape is quite unusual, and the gilding is good. to check for the sound of any repairs. Sounds OK - and you do have to have your own teeth. It's a piece of Carlton Ware, probably dating from the 1920s. I like it. Best price? -I was hoping you might say it could be Hanson's den - number...? -it's decorative. Put it there. That's yet another deal sealed. Good man. Now, Charles is in a bit of a pickle. Remember the set of six metal signs he reserved yesterday? The last quote was £380. The problem is, Charles no longer has that much cash. Oh,dear, what's to be done? But I've still got £348 left. Time to give the dealer, Jamie, a tinkle, I think. Thanks ever so much, I'll buy them. Thanks a lot. Cheers. All the best. I'm now down to nothing. I've bought the signs for £348. which could be dangerous. But he who dares wins, as they say. Who says? The SAS, and Del Boy! That's who. And so, that concludes the shopping. which he plans to sell in three separate lots. freshly filled with sweeties that cost her a fiver - and the parasol. But what on earth do they make of each other's lots? I love her bubblegum dispenser. and make a fortune. I hope not. do people really want those? Do people really buy those? Who knows? Time will tell. and are now heading for some selling in Bourne End in Buckinghamshire. Could it be the END for you in Bourne END? I might be born again in the end! ..this is not the end, it is not even the beginning of the end. Now, that's a quote. Time to get inside. Our auctioneer today is Simon Brown. Before the off, what does he make of our lots? The late 1970s, early '80s bubblegum machine, it's quirky. so I'm looking forward to selling those. The sale's about to begin. Starting positions, please. First up, it's Catherine's parasol. It's a profit, if not a huge one. Nothing to be sniffed at. Now, it's Charles's African mask. 40 I'm bid. Got you. 40. Yours at 40. 42. 45. 47. 50. 55. I thought you'd make more than that. Selling at 60. Are we all done? On my right, thank you. That's a nice winner to start him off. Had a nice colour, had a nice glow, like you. Didn't have colour, it was wooden. to take a pop at some profit. Nice stylish little piece there. -Who'll start me at £30, please, for this lot? Have we all done at 30? 32. 35. 37. 40. -That blew a big bubble. Ooh-hoo! And it's another winner for her. Next up is Charles's little Carlton Ware vase. Ten for the Carlton Ware vase. -Go on, sell it for a fiver. Go on, it would be hilarious. -That's not me bidding. I'm not bidding. -Are we all done at £5? Selling at five. Just behind, now. -I told you I was horrible. So the rivalry's really ramping up. and I commend them for very good taste. as her mantle clock, concealing a manicure set, meets the room. -Charles, will you be quiet? yours at 30. Are we all done at 30? -30, are we all done now? -Me? No, I didn't buy it. Thanks to the chap behind, she's nailed a winner there. which he's split into three separate lots, each costing him £116. We all done at 75 in the room now? And now, the next lot of signs. 95 now on the net. Selling at 95. -You don't need any more money. I do. Altogether, those three lots LOST - ha! - £48. Bad luck, Charles. and then you would have had even more losses. And that would have been good for me. as Catherine's railway specimen is up. £10 I'm bid. Got you at ten. 12. 14. 16. -Selling at 16. All done. -I thought we were on a roll, then. -You all done at 32? On my right. -Internet might have come in on that. -That's puffed and huffed like a train. -That was my steam train. Like a loco, and you really moved, baby. That did, indeed, puff its way to a nice little profit. -As I say, I'm getting there. Now, Charles's Art Deco-style dinner service. 60, then, to start. 60. We're coming down. 50? Anybody interested? It's a full room. 20. Someone feels sorry for you. 20, I've got you at 20. -He doesn't need any help! Selling at 20, are we all done? No need to gloat, Catherine, though that was an unlucky loss. The final lot now for Catherine. Her leather fire bucket might just ignite some interest. £50, please, for this lot. 50. 40, then, to start. Good bucket there at 40. 40 I'm bid. -Are you all done at 45? With me at 45. We all done now? Ooh-hoo! That went up in smoke. But importantly, Catherine, you had a passion for it. I don't know if I did, actually. Well, you don't any more. Our very last lot now, Charles's Georgian cut steel shoe buckles. Start me at £100, please, for this lot. 100 I'm bid. Got you. 100. -They're worth all of this. -How do you do that? 170. 180. 190. 200. 200. They dance away like a man in a fine pair of shoes. Did they have diamonds on them? Diamonds are a girl's best friend, baby. Give us a kiss. Ha-ha! And buckles are a boy's, it seems. he absolutely steals the day. Catherine began this leg with £213.76. leaving her now with £207.30. While Charles started with £478.88. After costs, he made a monster profit of £182.10. So, he now has £660.98. You're on my away patch now - well, my home patch. And on to the next leg. Are we in the right gear? Charles Hanson and Catherine Southon hunt for antiques around Sussex in their zippy 1950 MG Midget. This fizzy pair are a whirlwind of energy as they look to uncover big money plunder to take to auctions in Kent and Buckinghamshire. Will Charles's big gamble of 18th-century buckles get the bidders in a tizz or will Catherine's classical English silver be the order of the day? Charles delves into the pongy parable behind Brighton's sewers while Catherine finds out that journeying by horse and cart really is the best way to travel.